Thank you all who commented or wrote to me privately for your compassion and kind words. It means a lot to me. My days have been filled with grief and heavy sadness since Jossan died. We got her ashes home last Wednesday, on what would have been her 10th birthday. I just broke hugging the wooden box and cried again for hours. I miss her so much. It is hard to go on with your everyday life when you grieve. I worked even harder than usual in order to forget for a while. From my activities outside work I put together a magazine for my cat club. And we celebrated Leroy’s 11th birthday on December 11. We took him and Albert to our veterinary for a senior check up including blood tests. All great, kidneys, liver, no infections, no signs of arthritis yet, great muscles, no overweight. That was good to hear. When you lose someone you love you start worrying some extra about the other ones left. Their teeth were x-rayed and Leroy also had 2 teeth pulled out and Albert 4. Two more will be pulled out on Albert on 8th of January, and Claire’s teeth will be x-rayed then. They got FORL and there is nothing to do to prevent it that veterinarians know of. 72% of adult cats (including wild cat animals like lions) have FORL in at least one tooth, and often you do not see it if not x-rayed. FORL starts from the inside of tooth. Cat has pain, but many hide it well, you do not see anything on the outside. That’s why we x-ray their teeth once a year. I started with that when they turned 5. The boys are recovering well. Miii, Jossan’s blue sister, turned 10 on 27th December. She is a bit overweight and now when Jossan is gone I changed the food back to less calorie rich kind and we are working on her condition. Little darling, she is my constant companion especially in the summer in our garden. Then she runs a lot and gets a in really great shape. You see clearly on our cats that some things are environment and some genetics – Miii and Jossan were siblings and ate same food and all, and Jossan was slim, lean and elegant all of her life, while Miii was always very robust and prone to weight gain, like their late mom. Old strong robust English lines. Good muscle mass on both and a lot of space for running around helped their condition I guess. I do not know how you heal after someone you had such a strong connection and love with is gone. I guess you do not, just move along in time with all your memories and love and the pain becomes more dull with time. We got a lot of snow a week ago in Stockholm, but it got warmer again and all of it melted. The cats saw the greenish grass outside again and wanted to go out. But it is cold!! Today it is 2°C and Leroy draws his leave-the-house-limit at 17°C. But Jossan has a will of steel, and what Jossan wants, she gets from me. Breakfast in bed, any door opened even when I know it is freezing cold and the cats should not and do not want to go out. I opened the door for her and she took a quick walk around the house and pretended it is not THAT cold while she slowly walked back into the house. She lost some weight what is not unexpected, but she is not underweight. She weighs as much she did before her first pregnancy. I give her a lot of good fat and protein rich food to slow down cancer (cancer likes carbs). I am worrying about her and cannot sleep at night sometimes when dark thoughts get me and I get scared that it all will go fast, maybe if I am at work or travelling. But she is still well. I will know when it’s time. Miii, Jossan and Miii are enjoying a sunny Saturday on the balcony. So far so good, all the cats are well and we are getting ready for the colder period with long cosy evenings at our home. Jossan is well. We don’t know anything more than what we see. The external tumours in her one armpit are growing, but she does not show any discomfort about them. We don’t know more after the x-ray today. The veterinary was not sure if what she sees is blood vessels, age-related normal changes, or – metastases. Uh!!! I asked her to compare it with the x-ray they took last year in August at the same clinic when the radiologist said no metastases were visible. The veterinary checked it and still was not sure. She said we must ask the radiologist, but the radiologist is not there every day of the week, so we will have to wait…. for a week. Maybe less. I sent a FB message to Jossan’s oncologist Patricio and the vet said she will also mail him the pics promptly, but still, the best expert is the radiologist. Patricio answered fast, sent us his hugs, and said we wait for the radiologist. He thought it is probably age related changes, but still, the radiologist is the ultimate expert. We wait. We need to remove the growths asap, if the lungs are clean. We will be able to get “fast track” operation, if the answer is that the lungs do not have visible metastases. Now we wait. Uh. In my heart I feel it is not metastases they see, but it is just a feeling, or my wishes. If I could heal her with sheer willpower, I would. But we wait for a week and see what happens. Jossan’s teeth extraction was a walk in the park. She will be happier now without the last bits of inflammation in her mouth. After her operation last year (after we discovered that the cancer was back and the new growths were removed), I felt a tiny little hard lump where one of the tumors was removed directly after the swelling went down; in one arm hole, next to the rib cage. It was actually the only of the places where the pathologist said in his rapport that not all of the cancer cells seemed to be removed and the risk of metastases from there or local recurrence existed. So I followed it and also the vet checked it out, but her teeth were more urgent to fix. Also, it did not seem to grow, that little thing. But I have checked it regularly. It could have been a scar tissue, or not. Now I am sure that the lump is growing. I messaged Jossan’s oncologist this morning. He moved to another city, but is kind and said I can call him or PM him via Facebook about my baby whenever. ❤ That is a veterinary that really cares about his patients! I just know it is a recurrence. It is that place, same feeling like the ones removed, tough still smaller than the ones removed before. Since Jossan is feeling super top great, the plan is to x-ray her and then if there are no metastases to the lungs, operate and remove the growth, in order to minimize the risk for spreading. She will be continually on her COX-2 inhibitor medicine to slow down the cancer also. It would be a tiny cut and operation, maybe 1-2 cm long, not deep at all, the lumps (I think it is one, maybe two, one like a couple of mm in length, the bigger one maybe like max 7 mm in diameter) are directly under her skin, and she will have a fast recovery time. Me and Jossan at one of our veterinary visits. During the course of Jossan’s cancer, there was never any doubt in my mind what is the right thing to do. Jossan has such a lust for life and feels good, and her blood values are great. We will do anything in our power that veterinaries think is worth doing to help her live as good life and as long life as possible. I have a special connection with her and love her so much. And I would do that for any of my cats. We got the time for x-ray in two days, on Wednesday afternoon. Hope there are no metastases yet, I hope so much. She is feeling well and we hope for spring to come soon so that we can have walks in the garden together. Next week on Wednesday, a cat dentist will pull out a tooth that seems to be bothering her (FORL). We got okay for that, since all her recent blood tests are good, the cancer is seemingly under control at the moment, and we of course do not want her to have a toothache! Fingers crossed on Wednesday that all goes well with our Queen. 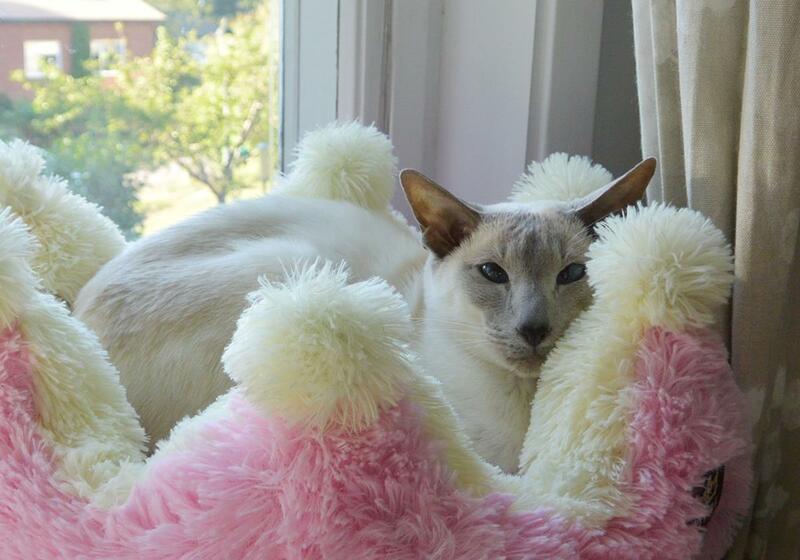 A cat friend’s Siamese girl, with the same bad type of cancer as Jossan has, was put to sleep 10 days ago. 😥 It has spread and took over her lungs with metastases so she was tired and could not breath without problems. She was operated and was on the same medication as Jossan for a few months, which prolonged her life a bit. But then it could not be stopped anymore. So tragic. My heart goes out to my friend. Life is full of surprises. We were focused on my darling Jossan and did not expect much from our (slow to become an adult, an eternal junior 🙂 ) boy Funtes. Yes, both Electra and Claire were in heat (with 2 weeks apart, Electra first) and they both were given privacy with Funtes, but we did not notice a single mating. Well, maybe he prefers to date while his humans are at work. Electra, Jossan’s daughter from her last litter, seems to be pregnant. I do not know for sure if it is a phantom pregnancy or a real one, but she should be about 5 weeks pregnant now, and went up about 350-400gr, so this could be for real! 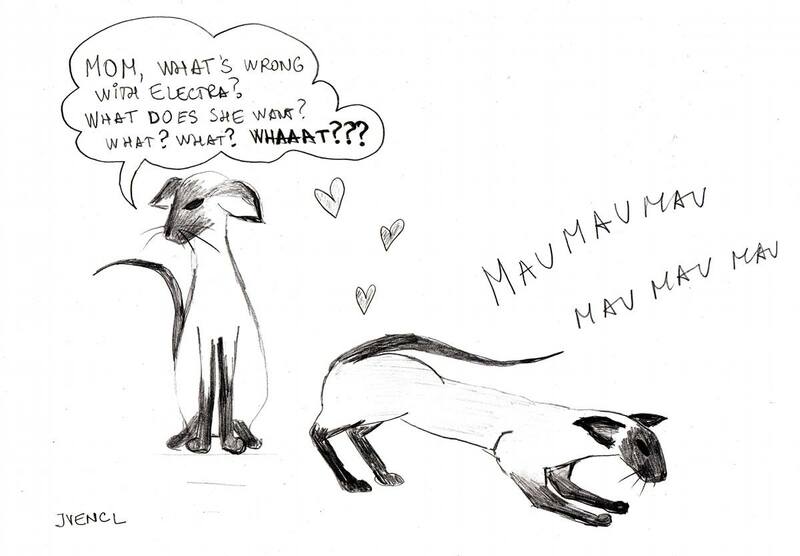 In that case, we will expect kittens between Funtes and Electra in the middle of November! Jossan is perfectly well now on the outside, I am spoiling her to bits. Breakfast in bed and all she wants. She is tolerating her Metacam well, no side effects. I hope it works and that she will be around for many years to come. We checked Leroy, Albert and Maven’s blood values recently. They also passed their yearly physical exam. They are well, and have no signs of arthritis or kidney failure or something bad. Good! Here are Leroy’s blood chemistry results, Albert and Maven hade similar values. Leroy is ground for our breeding, so I am happy that he is going strong, still. He is turning 10 this December. Miii was tested earlier this summer, also all well, but she is a bit overweight and we are struggling with that. 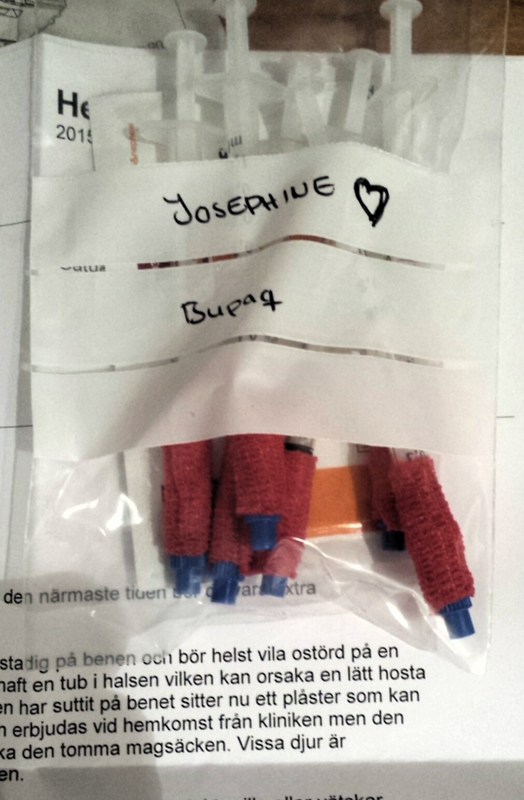 Last Friday we got back the results from Jossan’s operation, and it was very bad. All three small tumours they removed were malign, two seemed to be removed in total, one not. And that one was in lymph nodes, which means that the cancer has metastasised. The tumor was very fast growing, also. I felt completely shattered. It was Friday morning and I headed back to work after meeting the oncologist, Patricio Rivera, and getting the bad news, Jocke took Jossan back home. She was just happy and as usual. She has no symptoms, since the cancer did not spread yet to her lungs or inner organs (well, not according to the recent x-ray, anyway). When it spreads there and grows, when she gets symptoms maybe like coughing and being tired and not her usual self, that when it starts getting bad, and that is when I will have to let her go, before she starts to suffer. Not now. But my baby will never suffer. I own her that final grace. But I will not think about that now. We will get her regular checkups to see how it progresses and hope for the best. My working day was not great, I cried and worked, cried and worked. I was so sad. We did not get or asked for any prognoses, since no one can tell really what will happen now. She will not get chemo, since there is no chemo that can preserve her good life quality, and cure her. Only maybe prolong her life a little, but worsen life quality. Still, she will get this COX2 inhibitor, an anti-inflammatory medicine, Metacam, which is good for her, and can stop or slow down the progress of cancer. She will also get special food for cancer patients – a lot of fat and good protein, minimal carbs. One of the dry food that are best in that composition is Royal Canin Intestinal, according to Patricio, we got her that. I’ve also ordered wet food of same kind, and she also eats Bozita and Sheba chicken file and egg yolk at times. We will not give carbs to the cancer!!! My love Jossan had a great summer, she was healthy and happy and got to go out in our garden, lie in the sun, crawl through the bushes and eat the grass and hunt the flies. If you remember, we have discovered Jossan’s mammary cancer about a year ago and she underwent a total mastectomy after that. After complications related to the cut not healing well, we have changed the clinic, they revised the cut, got out the material that was irritating her and she healed fast and well after that. All was a total happiness again. Just about a month ago, her blood values were checked, she was X-rayed and she was considered to be in a remission with no signs of cancer. And then, not even two weeks after the happy news about her being seemingly cancer-free, I was cuddling with her on the sofa before going to sleep, when I felt a little lump in her right front armpit. And one even smaller next to the first one, and one more… there were three of them and they were like a pea, and half a pea and a peppercorn. And so I started getting cold chills and soon a full blown panic attack. It was back, or we missed it, or it was a microscopic, and grew. Jossan looked at me with her pretty loving eyes wondering why am I worrying. They always feel what we feel. I called and booked a time at the new clinic the first time next morning. We met a veterinary, and got booked an appointment with an oncologist, for a counseling and deciding what to do. I broke in tears at the oncologist. He was very nice and emphatic, but I was not prepared to talk about feelings and perception of life there. I am tough, I think, when we talk about medicines, studies, possible treatments. Facts and possibilities I can talk about easily, relatively disconnecting my emotions, but I cannot, without being prepared, talk about my love for my cat and what life means for her and how she sees it and why we feel and do the things we do. Joakim could not join us for our appointment, but we have already talked before about the money issue and other things and decided that we will do whatever it takes, if we can save her, without her suffering (a few days in stitches is fine, that she would forget, and we two are close then, she sleeps on me all the time and cuddles, and that closeness is also good). We will pay for it however much it costs (will probably go over the max sum what insurance covers). The talk to the oncologist went well, besides that part with me crying a bit (while Jossan was happily jumping around and exploring the oncologist’s office). We have decided to remove what I discovered, look for more and remove what more is found, too, during the surgery. Since she was x-rayed and examined very recently, we knew that the cancer did not spread (visibly at least) yet, so we still could hope for the best after this operation. I am a firm believer in surgery against cancer, that if possible, it is the best treatment. We’ve met before, cancer and my close family, both human and pets (a dog), where surgeries were successful and the cancer was gone after them, for good; in one case after only one operation, in another after an extra surgery. Jossan will also receive Metacam, half a dose, every day, for the rest of her life; it is an anti inflammatory medicine that can inhibit some of the tumor cells. No kittens (this time), but 4 newly scanned perfect hearts. She went down in weight after 7 weeks of pregnancy, little by little, but still carried what turned out to be empty amniotic sacs to the term. Sleepless nights before we knew she has no kittens in, her started bleeding a bit, urgent visits to veterinary clinics, worries and tears. Claire is a tough cookie, she already started resorbing the stuff in her uterus. No signs of infection or inflammation. She got a medicin (Alizine)e to help her expel the contents and they sampled the fluid coming out. We will take her to a new ultrasound exam now on Monday, see if all got out, and in 10 days we will see a specialist in gynaecology/fertility for cats to discuss why this happened. I was worried about Claire being scanned, she was there to get another injection of Alizin only, and had her heart scan booked in 2 weeks, but the veterinary thought she was well enough and that her condition would not influence her heart scan, so they scanned her as well as her mom and half sister. And the best news 🙂 ❤ 🙂 – Funtes has a healthy heart, and is absolutely approved for breeding! We went to see a cardiology specialist today (previously Funtes was scanned by a consultant within cardiology, whom I guess is good, but matters of heart are difficult, in every sense, and in Funtes case we needed what we were told by some of the other breeders was one of the best teams in Sweden. Ultuna cardiologist team). Ultuna was informed about the previous scan and what I was told. Well, it turned out that what Funtes has, is not an aberration or thickening, it is something called a ‘false tendon’! (I must admit I’ve never heard of the term before). It is some kind of fibrous tissue/bands and is an anatomic variation, not a pathology. Other thing that was noticed on the first scan – turbulence on Doppler when Funtes yelled and struggled (poor him hates to be held by force, it was much easier to scan the girls, they just were lying calmly, protesting very little) were not considered a pathology by the expert today, it was normal “bubbling” that Doppler showed. All the measured parameters fall within limits for a normal, healthy heart! He was absolutely approved for breeding and his heart was declared healthy today! We are very happy. First and foremost because his heart is perfect (which in a way we never doubted), and then because I got so much support and good advice after being open and writing about Funtes on Facebook also, which prompted my breeder colleagues and friends to give me good advice and pushed me to look for a second opinion, which led us to where we are today. Openness puts us out there with all the bad but also good things that come back to you. I am grateful and believe that if we ask for help when confused and sad, we will get help and ultimately together we will do the best for our cats and the whole race we work with. It was the same with TF, I got helped the most, by absolutely by far the most by people that had read this blog and mailed me. I am grateful to them forever. So that is a lot lately – our expectation of kittens led us to a heartbreak for Claire and the loss, the girls hearts are scanned, and Funtes is back to being perfect hearted and kicking. 🙂 So much to take in, so much! Next station – checking why this happened to Claire and trying to fix it if possible, and then attempting to mate Claire (if she is ok) and Funtes and Funtes and Electra. Hug cats. Sleep. Try to enjoy the other half of my vacation. I love my cats. So much. 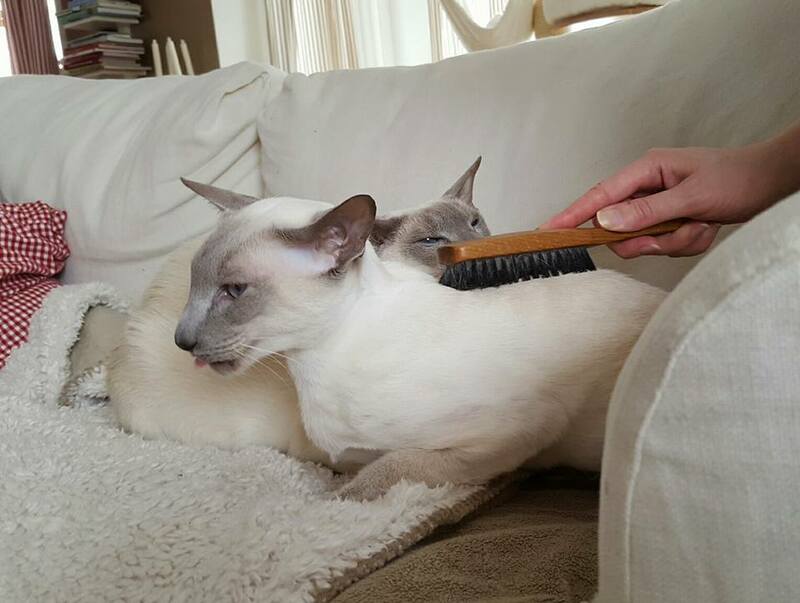 I am grateful for having amazing Siamese cats in my life, they made it so much better. But I never thought that I will experience so much heartache as a breeder and owner. Me and my husband always wanted to own and breed healthy cats. Which breeder doesn’t? I deeply believed that Siamese and Orientals are a healthy race. And it is and it should be. But we have to do more. How much do we check? Can we possibly check for all? No. Only for the things we know may be an issue. I tested for PRA, as soon as knowledge about it become available, before it was obligatory. I was lucky that my cats and kittens I bred did not have double set of faulty chromosomes and would never get blind. I tested liver, kidneys, viruses. All I knew or heard could go wrong or was recommended. Years ago I’ve only heard remotely about TF (tritrichomonas foetus) and giardia (it always happened to someone else, you know, in some other country…) when we got TF! I was open with our struggles here on my blog and, while I had support from the most, I’ve actually also had potential buyers saying – oh, great you are open, I appreciate that, but then they went to buy kittens from people who had TF in their catteries, gave it to others while knowing that they might, sold the kittens with TF and did not care to say that! Our kitten buyers trust us what we say. If we are silent, they still trust us that we sell them healthy cats. They cannot know about all that can be wrong. Well, that war on TF we won. Got all clear. A new page, clean cattery, healthy cats, my new import, he and all others scanned four-five times for parasites, healthy, no viruses, nothing. Picture perfect. Last December I had a young cat who died in a total heart failure. Heard only whispers about cats dying, but no – no heart disease in our race. Pretty cats winning the shows; some have TF, some get put to sleep for heart issues, kidneys or something, it is all silenced down. Now you see them, now you don’t. 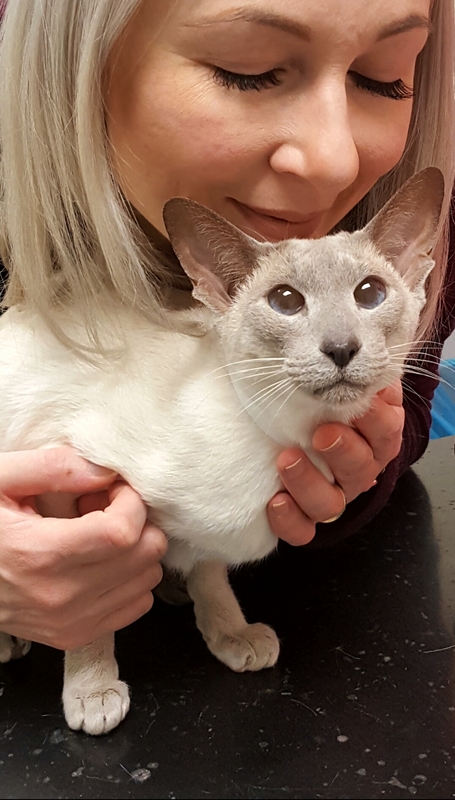 A fellow Oriental cat owner had her heart broken recently when her cat died from heart failure. Another one got the sister cat from the first one scanned last week – the same, genetic issue. I really hope that the parents, siblings, half siblings etc get scanned. I took my Funtes to an ultrasound specialist today, after learning more and more about the heart issues in our race. The issues I did not think were a problem at all. Maybe minor thing, here and there. And Funtes beautiful heart, sounds amazingly well – picture perfect health, but then, on the screen – just this little thing (I cannot see it, I have no clue how to interpret ultrasound of the heart) – a tiny little thicker tissue, or was it – a thread. Almost nonexistent. No, no stenosis, but it is there! It is there. Almost perfect, but not. He will never get worse, he will never get sick or unwell, he will never need medicines. He will always be perfectly healthy heart wise. He does not have HCM, or any cardiomyopathy he has a little extra something that will not get worse. That is his diagnose. 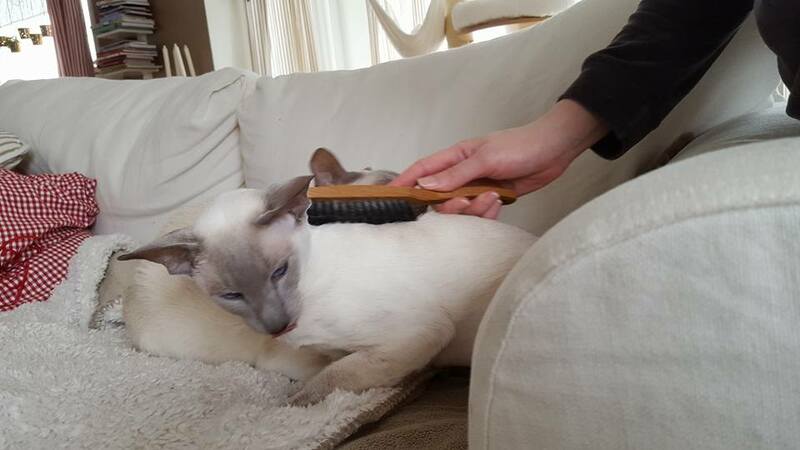 But – according to the ultrasound specialist, it is a common thing on Siamese and Oriental, and it is genetic, and it can be worse than in his case. Can I breed on him!? The veterinary was hesitating. No definite no. But no yes either. He would probably not breed on him if he was his cat. It depends on who Funtes is mated with. We talked about how we should scan our race more, breed away the defects! Not be silent about it, raise the awareness! But we have a litter in Claire’s belly where Funtes is father that is due in 3,5 weeks. I talked to the veterinary and we will take them all to him for a complete heart scan when they are 12 weeks old. You can see already then if they have something or not! Funtes and Claire are expecting kittens. If we are lucky, they will not have anything and if healthy otherwise, can be used in breeding. If not, I hope the little fault is as little as on their father and can be a long lived pets with no influence on their lives. 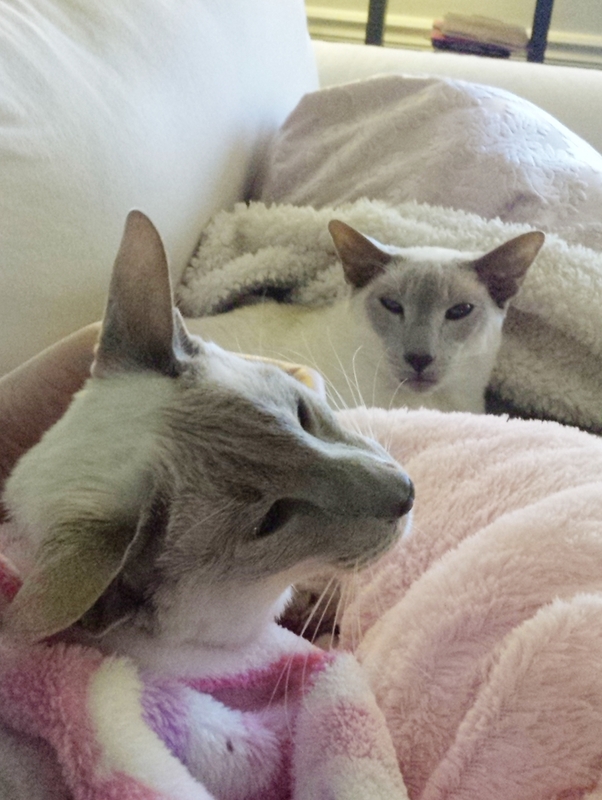 We should heart scan our breeding Siamese and Orientals. 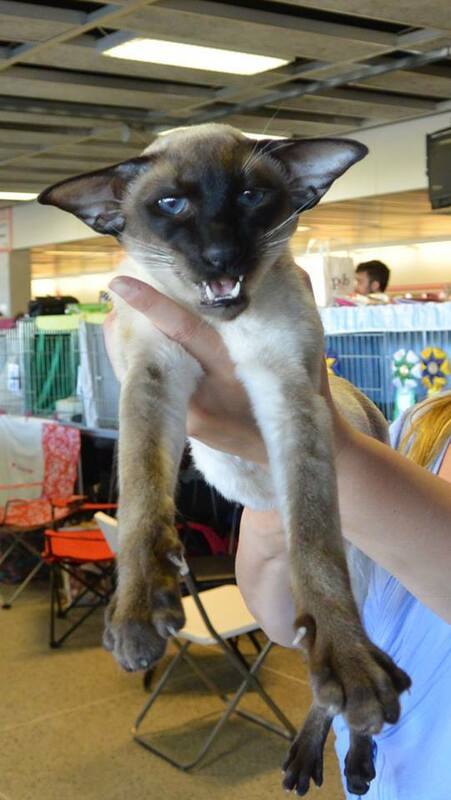 We do not have HCM in our race, it is almost non-existing on Siamese and Orientals, but dilated cardiomyopathy that my fellow Siamese/Oriental owners had on their cats is common, and what Funtes has is common. If one in the litter has something, and we know it, we should scan the siblings, offspring, parents, used in breeding. It should become a practice. And we should always select on health before type. Ethical breeding – we are responsible for the health of our animals and their offspring. We do not know all, but as soon as we learn about the possible problems, it is unacceptable to just close our eyes. This on Funtes is no one’s fault! And luckily it will not influence his life or health. But it made me more aware of the possible heart problems in our race. When you know there is something in the lines, or in your cattery – an infection, a virus, a parasite, a disease and you breed on that without curing the cats, or scanning them and just close your eyes and continue – it becomes your fault. Also, if all goes well, she will become a grandmother (Claire & Funtes will have kittens), in about 5 weeks. After 2,5 and more years we may have kittens in our home. 🙂 Fingers crossed! We sometimes organize events or presentations in my cat club (Siameslinjen), and last Saturday we had a guest veterinary Linnéa Brandt who held an excellent presentation on a subject of older cats (on a cell level cats start aging from about 7 years of age, so in a way, all cats older than 7 years are – older cats). One of the leading death causes in older cats (more than one third) is a chronic kidney disease (CKD). During the presentation I learned about one thing I did not know before – there is a new test available that can help us discover the scary kidney disease earlier than before, during an annual control of our senior furry family members – the IDEXX SDMA blood test. SDMA typically increases when there is on average a 40% decrease in kidney function. This occurs earlier than creatinine, which doesn’t increase until there is up to 75% loss of kidney function! We have tested our older cats (most recently Leroy a few months ago, Leroy is 9,5 years old now), and their urea and creatinine were fine, but – they would be fine until 75% of kidney function is already gone! I want to catch this bad condition early, if it is bound to happen, and adjust their diets in time and have them live long and good quality lives! I have mailed one of our veterinaries about the tests, asked if they perform it. I know it is not done readily in Sweden yet, but some veterinaries send it to Idexx laboratory in Germany. I just wanted to share this with you who may read, to know about this great new test! You may read more here. Yesterday I was so happy I cried. Jossan has healed and, after months spent in her little body sock, stitches after the cancer operations, infection, complications, depression brought on by the loss of her best friend, she is whole again. Happiness!!! 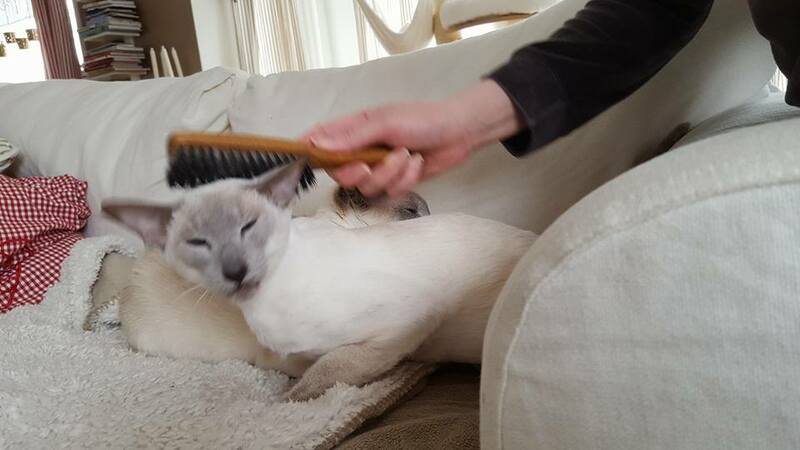 She is purring and grooming herself her and I am helping (on the pics, she loves to be brushed. Not much hair, but she enjoys it. Leroy is half-napping behind her). She is still sleeping curled next to me and is in my lap almost all the time when I sit down at home. My heart is filled with love and I am happy she is well now. Last two and a half weeks went both fast and slow, part like a dream, part like a nightmare. At moments it was very painful, sometimes I felt sedated by chemicals produced by my own body. We have capabilities to both hurt and heal. Our focus shifted from primarily grieving to taking care of Jossan. After her second operation she got complications – a part of her cut would not heal, and close. The infection she got was cured by antibiotics she got, but the edges of the cut healed each for itself, and did not meet here and there. I feel that she was not sewn that carefully after the operation, the upper part of her chest was sewn so-so; I tried to tighten the knots after a week, and managed with a lot of patience and work. Jossan trusts us 110% and was calm and waited for me to untie and then tie again the problematic knots of her stitches. That helped, the cut healed, but not everywhere. We went to the vet twice again, and they booked a surgery (the third one!) acutely in case the hole does not close, on 30th of December. The hole did not close, partly because of the too eager nurse who cut of about 1-1,5cm from the thread ends on our second visit, in spite of my objections (“It is plastic, it irritates her skin”, she said.” Yes, but it will get untied”, I said, “there is a reason that surgeons leave them that long!”). She cut them of anyway, and the stitches went off in the evening and Jossan got to have a surgery. On her revision surgery they trimmed the edges of her skin that did not close and pulled them together and sewed them again. 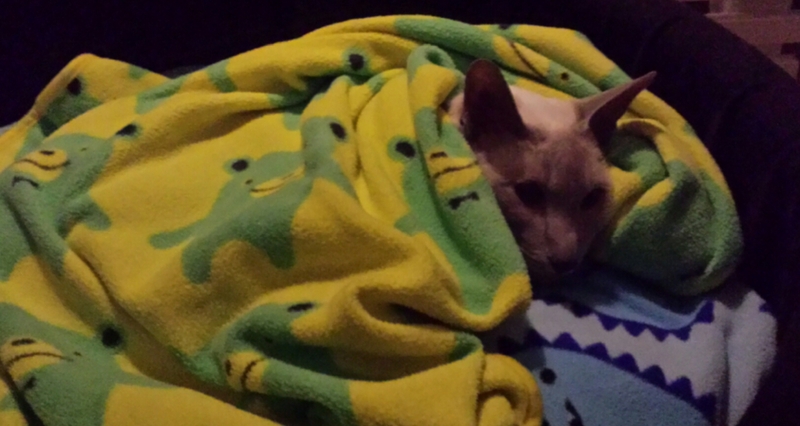 My poor cat got to recover for two weeks longer than we expected at the first place. The biggest problem in her recovery was not the hole that would not close; it was that she got depressed and would not eat, LillMupp’s death made her very sad, he was closest to her of all the cats. So, I fed her, carried her around on me, lied next to her during the days and nights. She was so sad, we were sad. It all was dark. Yesterday, finally, the hole (that was not sewed properly again, IMO, and I tightened it, again! ), closed and Jossan started eating more and more. I see it finally turning for the better and the future looking brighter. The good news is also that they did not find any cancer on her other side. The tumour she had there was benign. That and the fact that all was discovered early and removed early, gives her relatively good prognoses, for a cancer type that usually has medium to very poor prognoses. I hope she will heal fast now, when she started eating on her own (I do not have to feed her for hand all the time anymore) and the cut is closing. The most important is that she got stronger than her sorrow. She is very tough. I still am very sad and grieving. It will take time to think about it less, but feelings of love and pain and loss will always be there. They will move more to the background with time. My ever rational brain figured out one thing while I was half-asleep two nights ago; after LillMupp died, I felt like swimming in dark cold waters under a night sky without stars all the time. That night in my bed my mind understood which is the straw I’ll be grabbing. My straw was Jossan and her little warm body next to me, in the bed. There is so much beauty in love between her and me, that gives me physical feeling of energy and light and warmth in my heart. I love my husband and my other cats very much, but right then it was Jossan and her loving me, and her needing me and me helping her and loving her and nourishing her back to health that became my straw and the source of love and beauty I felt in my heart again, in the middle of all the sadness and darkness. We have already received the results from the pathologist. To sum it up – it is the least bad kind of bad news. Jossan has cancer, as we expected, and we seem to have detected it early, as we hoped. It is also not a very aggressive tumor (at this point), and is of type that gives the best prognoses. It also did not seem to have spread to the surrounding lymph nodes. I have attached the report if one is interested (click to enlarge). Mammary glands cancer in cats has similarities to breast cancer in humans. I did not understand all I read in the report at first, but I have looked it up, understood it all, and got a bit relieved. Talked to the veterinary later, she confirmed what I already interpreted from the report. She also told me that it is almost never this good bad report they get back from the pathologist, usually the tumours are faster dividing and the grade is higher. They progress fast, it is easy to miss them, and they are detected later that one could hope for. We will take care of our dear girl, and hope she will get cancer-free soon! Today I found another lump on her other side that will be operated in December. Mammary gland cancer tends to be bilateral in cats. I am very nervous, but I cannot rush anything. They cannot operate two sides at a same time, and also, after the first operation, she has to heal and the skin should not bee too stretched so it could burst after the next operation. I have many mixed emotions, and sometimes I cry, sometimes I am optimistic, all in all I am pretty shaky. But above all I am happy that I have her and that she is recovering well from the first operation. The first day of Jossan’s recovery went well, considering the circumstances. The night was a bit tough. She did not want anyone in the room, beside me, so the other cats had to leave. I hugged her and tried to get her to eat some, and she did. Small portions. She did not get sick or threw up. She was in pain last night, in spite of the opioid analgesic she is getting (Buprenorphine). Today she seems to have less pain. I am giving her the painkillers according to the schedule. We both were tired today, but I was happy I could help her feel a bit better by being with her, she takes care of me when I am not well, and now I take care of her. It is love. Our other cats are like that, too. Today it was better, she wanted to be around other cats, so I carried her to the living room. I worked from home, and I sat in the dining room and could see her all the time (we have a big open space kitchen/dining room and living room connected, no doors). Leroy and Miii were allowed to come close and Leroy even was allowed to lick her head a bit. Jossan is the queen, she decides. Leroy, Miii and Jossan. It is warm under, the radiator is on. The cats love that place. Joakim and I changed her bandage in the afternoon. It was soaked with blood (she bled right after the surgery, it is not new blood), but the cut looks good. No infection or something odd. It is very long, about 30cm and a lot of tissue is removed under. I washed it with saline and we put new sterile pads over it, taped a bit, and the body-sock went back on. Omnomnom, tasty! Jossan eats when I bring her the food on a small plate. 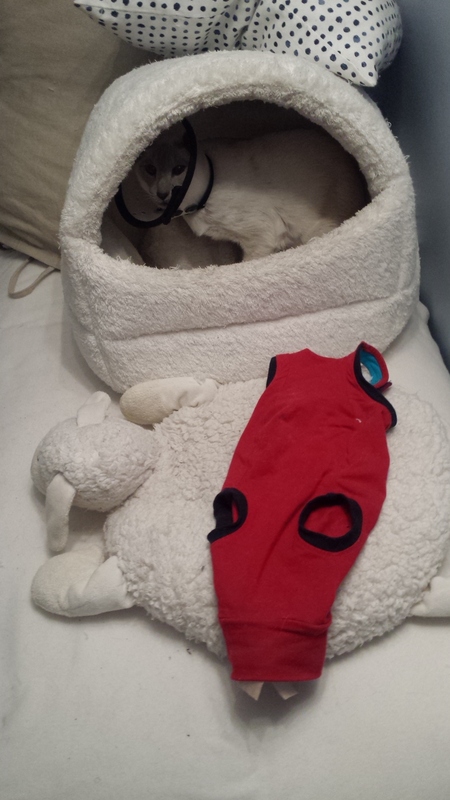 We’ve just came home with Jossan and put her in her bed, in front of the warm radiator. She is in half dark, in a calm and safe environment. She is still tired and painkillers make her calm and a bit sedated. She got a lot of IV fluids today, after the operation, and a medicine against sickness, they said she was a bit sick and threw up after the operation. The operation went well, I talked to the veterinary after Jossan woke up from anaesthesia. 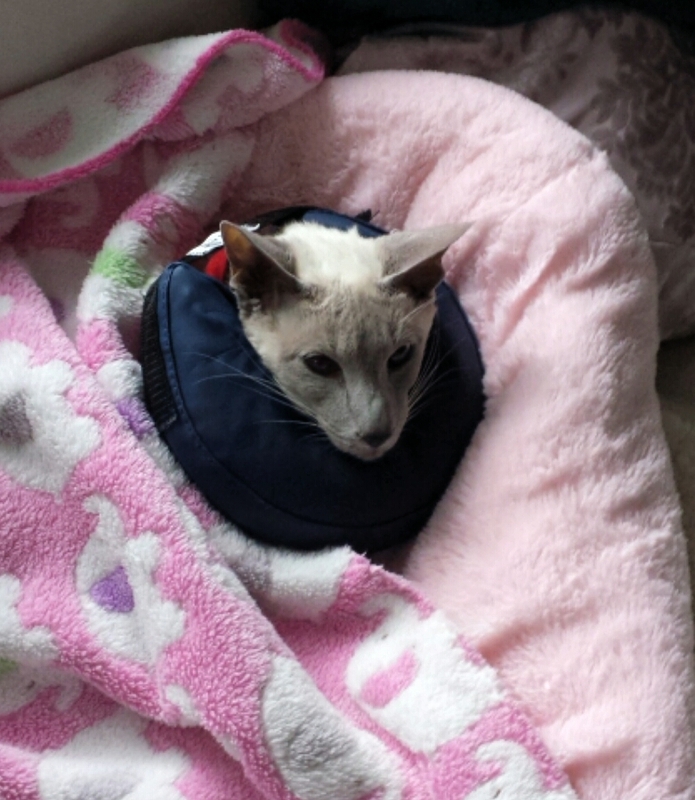 Jossan is a fit and slender cat, small to medium in size (she weighs 3,4 kg), but very long; the veterinary said that she had a lot of mammary glands mass in one row they removed (t was a unilateral operation, they removed the whole chain of mammary glands on one side). The veterinary found one more small lump besides the ones I found, high up towards her armpit, she removed all she could from the surrounding tissue. It is sent for analysis, the results will be in two weeks. Jossan has gotten body-sock, like a baby, in order to protect the cut that is very long. She has a lot of stitches. The veterinary thought the body might work better for Jossan than a cone (Elizabethan collar). We will try and see. She will get painkillers in her mouth with every 7 or more hours between the doses. We got them with us from the clinic. She can eat little, when she is ready for that, soon, we hope, small portions at time, not to irritate her tummy. 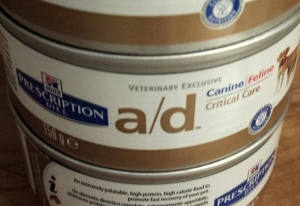 I bought a/d, it is good for her and it is tasty; it is food for recovering patients, and it is high in nutrients. I will be at home with Jossan, and check on the wound regularly for a few days, and then remove compress that she has on, after two-three days. 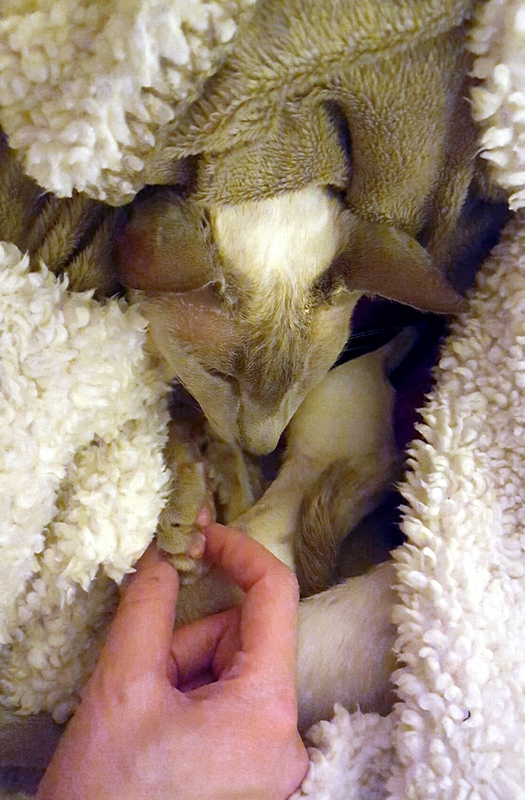 Jossan is resting in low light, covered with blankets and in front of the radiator, to keep her warm. I know it will be malignant tumors she’s got, but the question is which kind and what more can be done. The surgery as it is done, plus removal of the glands on the other side in a second surgery gives the best prognosis. But we take one step at a time. Jossan does not have any family history of mammary gland cancer, but she was not neutered young, and she was on contraceptive pills at times. She was not often on them, but even little increases the risks. 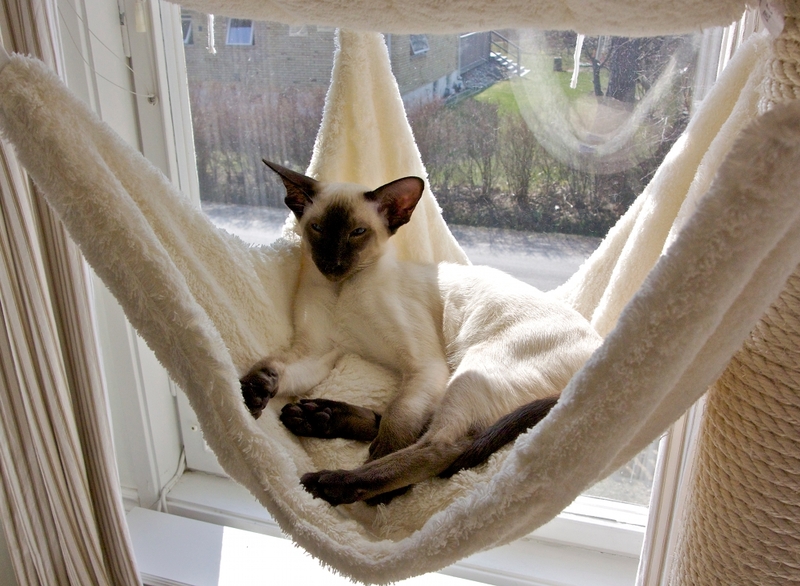 And she is a Siamese; Orientals and Siamese are for some reason more prone to mammary gland tumors than other cat races. You go around and hit your head against the wall and ask yourself – why, why, why? But then, it is bad luck and accident; that is why. “Cats with tumors larger than 3 cm in diameter have a median survival time of 4 to 6 months; cats with tumors 2 to 3 cm in diameter have a median survival time of about 2 years, and cats with tumors less than a 2 cm in diameter tumor have a median survival time of over 3 years.” I read more here. But then, there is statistics, and there is life. Jossan is my cat, I adore her. She is one person’s cat, and I was lucky to be that person. She chose me. Jossan is turning 8 years in December, and she was always healthy, more or less; she had a food allergy once, some teeth problems that were all fixed latest this June. She also had an idiopathic cystitis once, when I closed the door to our bedroom for about a week at nights and she could not sleep in my bed. I was just operated and no one could sleep close to me, because of my cut healing. She was crying in front of the door at nights. Joakim tried to cuddle with her and calm her down, but it would not last. I cuddled her, it was ok, I would crawl back to bed (it was hard for me to move), and she was upset and crying again. I guess I smelled like hospital still or she smelled I am not entirely well yet. She was examined and got noninflammatory medicine that helped her symptoms, but basically she got well when I got well. She and I are very close, Joakim says we have a telepathic connection. Sometimes it feels like that, it is true. She gave birth to her kittens in my lap. Only one, Eleonora was born in our bed, without me being there at the begining of her giving birth. She was in her top form this summer, and was even exhibited and got many appraisals. But that all changed recently, she started picking her fur, I though – allergy again? What now? I started changing food to what I knew she never reacted to. Not better. I brushed her teeth, she got Stomodine gel in her mouth (she is prone to gingivitis). She did not get better. She eats well, she is as happy and cuddly as always, but something is not right. What, what?! I examined her and felt a cluster of small knots in one of her mammary glands. I froze. I just felt I was falling down into nothing. The mammary gland tumors in cats are often not benign, they are almost always bad.That was late Sunday night, and I was on the phone to the veterinary Monday morning (this happened 10 days ago) when the veterinary clinic just opened. We got the appointment the same evening. And, what we found out, after 2 hours of examinations there – the blood works is fine, but the tumors must go away soon. She will be operated tomorrow. They did an x-ray on Jossan, since those kind of tumors may be aggressive and spread fast, often to lungs. Her lungs and other organs looked good! That felt a bit better, but I still was sitting there, crying. Jossan’s fur picking seems not to be an allergy, but an over reactive immune system. She has what it looks like a beginning of stomatitis in her mouth, so it could be that that causes the pain which makes he pick her fur. It can be managed sometimes with cortisone (prednisolone), or in different ways, even extracting all teeth in some cases. They are not sure yet what will work for her. We are taking one step at a time. First Jossan got Prednisolone to get down the itch and inflammation in her mouth. We started with a high dose that we went down with, before the operation, since taking cortisone may slow the healing process after the operation. We started with that immediately after last Monday’s veterinary visit. Prednisolone worked well, she stopped itching, and is not pulling her fur anymore. We went down in dose now, she is still well. That is good! Tomorrow she is having her first surgery, they will remove the whole one side of her mammary glands, then analyze it and we will take it from there. I will work from home on Friday and take care of her. I am very nervous and on a verge of tears often. She is my baby. I hope so much we caught all this in time. She had no tumors I could feel in August and September and she had dental check in June and all fine after that. I promised her she will be well, and pain free and run around in our garden next spring and summer again. I remember that two years ago we felt so bad – our cats got infected with TF (Tritrichomonas Foetus), two of our Queens were pregnant and we were sick worried about them, our other big cats and kittens to come. Now we have been Tf free for some time, after a long struggle, three latest negative tests were done this March, July and now last week. I would recommend all breeders to test for parasites regularly, Giardia and TF, not only FeLV/FIV and other viruses. Treating parasites and getting rid of them is hard. 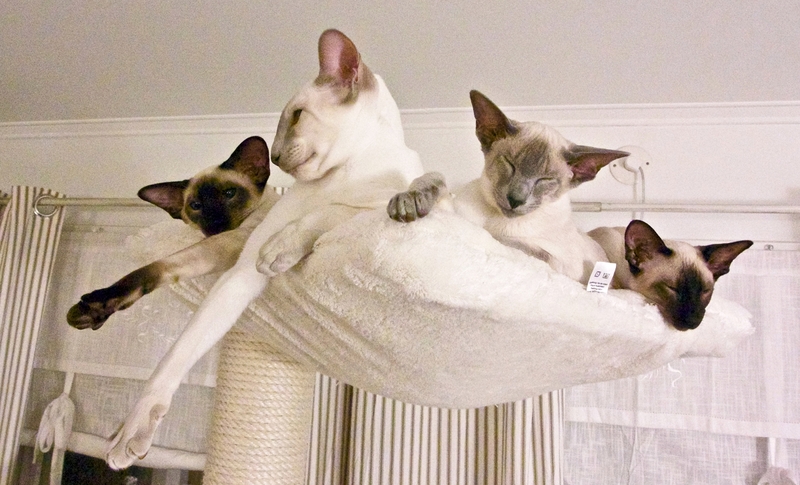 We are lucky that after a lot of dedication and struggle we managed to get all of our cats well, negative and healthy. We suffered a lot, mostly emotionally, being sick with worry, thinking what to do and how and wondering if it will ever end. Also, it was not cheap to treat the cats and test so many times. I have used Laboklin in Czech Republic to send tests to, they are very good and a bit cheaper than our Swedish lab, it makes a lot of difference when you send tests for many cats many times. We have also imported an adorable male kitten last March, whom we call Funtes. His name is Dexter Slunce Moravy, CZ from a breeder from Czech Republic that also tested all I asked for. He was retested also twice after he came to us, he is a healthy and happy young boy! The war I may not win? I wonder if this is a war we may not win. We have certainly lost a few battles and the things did not turn out as I expected. I had to mix the first batch of medicine against TF with a protection mask on my face and put in the cats’ mouth. It took about 2 hours every day to medicate them all. They of course did not like that. Sometimes they drooled. It did not taste that well, perhaps. But maybe it was not THAT bad, since the most were not drooling or spitting it out. The medicine we got was ‘produced’ in Sweden, but actually it is just a cheap powder for birds, 10% Ronidazole that they imported from Germany, repacked it, and sold it to us about 70 times the commercial price in Germany. But what were our options? Ronidazole is obtained only via license in Sweden. The powder made for birds was not the appropriate form to give to cats; it is the very formulation that scientist and one of the world’s most famous researcher on TF in cats, Jody Gookin is against, since you cannot guarantee the dose that cats get is exact every time. Some cats get cured from it, some don’t. I read about cases on German discussion boards where cats died. Ours did not have any side effects, and I am happy for that, although they did not get cured. We tested the cats as a part of the study we are in 2 weeks after the finished treatment and only Claire and Miii were negative. All six kittens were still positive and also four of our big cats. 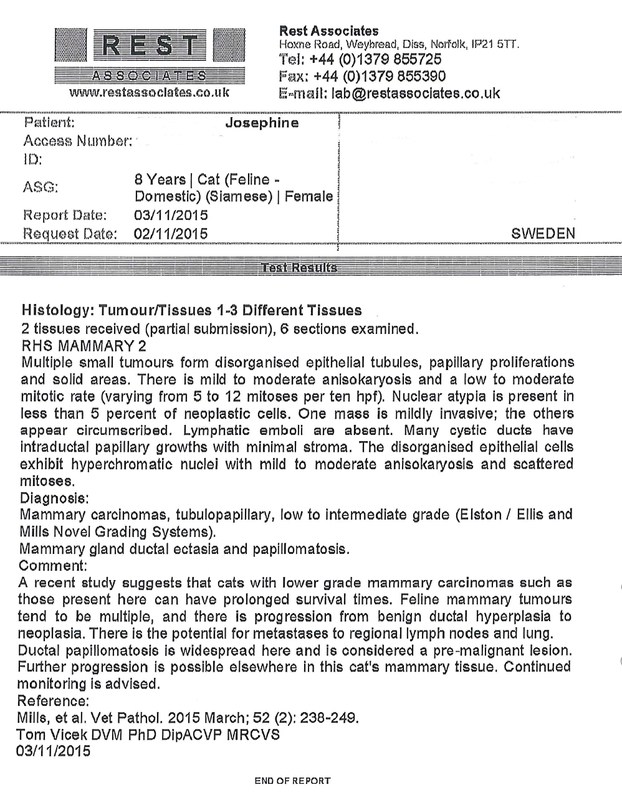 So, only 2 out of 12 cats were negative after a 2200 EUR treatment (20 000 SEK) and a lot of time and effort from our side! That felt like a disaster. Also, Maven, who is not a Siamese, has her own toilet box (she likes Pee-Wee, Siamese hate it), got really bad and she was alone in one room, since poor thing had watery diarrhoea. Two-three kittens got a bit better at start of the treatment, but after a week they started having soft smelly stool and blood in it. I tested them immediately after the finished treatment (that test was not a part of the study) and they were positive. 😦 Ronidazole just did not seem to work. I wondered if TF our cats had was resistant to the medication, but then, Claire and Miii got negative. They could have gotten TF-negative on their own, though, that is not impossible. They got it 5-6 months before the time they got retested, and sometimes cats can get rid of TF on their own during that time (9 months in average). But no kittens could move to their new homes, since their owners-to-be already had other (TF-free) cats and I also wanted to cure the small and big ones. To cut the story shorter, and omit many details – the new medicines were ordered, our veterinary found the new company that could get it for us, this time in capsules, from England, good form (100% Ronidazole). Surprisingly enough, they were cheaper, and although kittens got up in weight (the dose is proportional to the weight, the dose is 30mg/kg, so if your cats weigh more, you pay more), we paid about 75% of the price for the first batch. And the form of the medicine was good, and capsules are so much easier (and less risky for my health) to give. Our veterinary suggested that the kittens should move to their new homes and be medicated there, to minimise the risk for re-infection at home, since we had so many cats. At the same time, it is not a good way to bond with your kitten you’ve just got with putting the pills every day for two weeks in its mouth. I proposed to the future owners of the kittens who had homes who waited for them to get them immediately after the treatment was done. There were risks, but also, it was better for many reasons – if someone else at home still had TF and its quantities grew again, the cured ones could get it back. 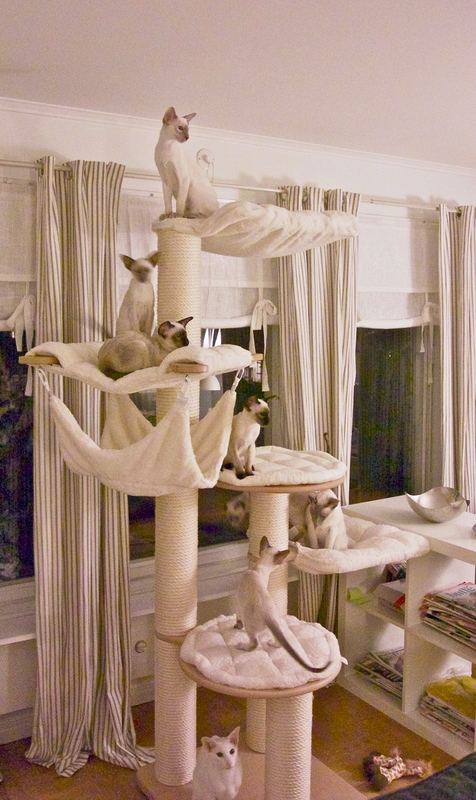 The cats were isolated, but not one and one, we found that pretty much impossible. One owner to be took her kitten 4 days before the medicating was done, and finished it at home. Another couple took their kitten home immediately when the treatment was done. One decided to wait. One was travelling abroad, and could not pick her kitten. One kitten’s future owner changed her mind (not because of TF, but because of a beauty fault that the kitten developed; she was supposed to go into her breeding program). Dexter we did not have heart to sell. As I write this, I am still waiting for the results of the tests after the second Ronidazole treatment. The cats at home had an occasional diarrhoea after the treatment, but right now they seem fine. The two kittens that moved are well in their tummies, and no foul smell, and the cats that they live with are also well in their tummies. No matter what the results of the tests are, I would have made the same decision as the ones who took the kittens did, but I did not want to decide for others. There was not right or wrong here, only “risky in this way”, or “risky in that way”. My other option was to find new homes to the kittens where there were no other cats, but their future families opted against it. And that was not the option I would be happy about either. The homes that were waiting for the small ones were the perfect homes. It is a very hard situation, emotionally, and in many other ways, both for us and the owners to be; they waited for their kittens for so long, and then I did not have good news for them after the first treatment, and we had to wait for a long time for the medicines to arrive, just to go through all of it again. Our veterinary was fast to obtain all the licences, and to help us, but that is the procedure – it takes time. So bad. I did not think this will be such a nightmare. I thought we were prepared. The kittens who moved are very loved and happy in their new homes, Tsuki and Ender (called Ozzy now) moved. The kittens that stayed are also loved here, but they will need to move to their new forever homes soon. Our big cats are okay with the small ones still being here (they are six months now! ), except for Jossan that occasionally hisses at them, saying that it is time they move, and Claire that became angry recently and thinks they should move. It is normal reaction, they are moms, and in the nature they should push out their small ones out of the nest at some point. Albert and Leroy think that it is good that they are here, we should have 200 cats, they love cats! Maven and Miii are okay with them, they play and run around gladly with the small ones. The kittens are big and beautiful, you would never think that they had (and maybe still have) that parasite. We love them so much, and we hope that this nightmare will be over soon. We are half way through the treatment now! I found out that it is easier to make breaks and do something else between medicating groups of cats, I get less exhausted that way. Now I give meds to 3-4 of the big cats, first, then to 2-3 of the big ones and then the kittens, they are the easiest to medicate. 45min – 1 hour traveling to work. 1 hour eating, getting ready for bed. 2 hours other chores, answering mails etc. Cats are with me. Sleep? 6 hours? If I am lucky and everything flows. I am so tired. Then I go to bed and I am too tired to sleep, too worried about the cats and will they be cured after only one round of medications. I worry about different things, my family and what is my part in changing the world for the better. The cats are feeling well, and we notice no side effects. No one has soft stool anymore, already after three days. And I almost forgot – the best part of my day is when, after medicating the cats, and before going to sleep, Joakim and I eat ice cream on the sofa, and all the cats are cuddling there with us or playing. After I wrote my blog post yesterday I kissed the kittens good night and cleaned the litter boxes. And there it was, a cow-pie like poo in one of the ones that the kittens use. So it starts. 😦 And this morning there was an another one. Good that we will start with the medications tomorrow. TF (tritrichomonas foetus) lives in large intestines, where all the nutrients are already absorbed when the food remains come there. What happens there is that the part of water is taken back to the body and if a cat has TF which causes diarrhea, the water that would otherwise go to the body comes out and the cat can gets dehydrated. So, if a small kitten has diarrhea from TF (or anything else) – hydrate, hydrate! Give the kitten a lot of liquids! If it is a bigger kitten it may be enough to drink milk, water or or water with electrolytes, but a smaller ones will need extra liquids under their skin. I read about that and that is why we had two veterinary clinics informed about the possibility that our kittens may need re-hydration if they get Tf and we could come there with them urgently without waiting to help them. But no one got it until now. And it is not a diarrhea, but it is more watery that the normal stool. That is exactly how our bigger cats had it at start when they just got TF. It normalized with time. Leroy had the most of problems, but that I solved at the end with help of coconut virgin oil supplement and low fat food. The thing is that TF ‘eats’ fat. All kind of fat except dodecanoic acid is promoting TF growth. And that is very interesting; dodecanoic acid (“laurinsyra in Swedish”) is as effective as Axilur (Panacur) against Giardia, another protosoe that is similar to TF, but lives in small intestine (our cats are tested negative to Giardia, and we never suspected it, but since we tested against many things, we checked that, too. They had ‘only’ TF, nothing else). The dose of cold pressed coconut oil for the cats is 1/4 teaspoon (or 1ml) 2 times per day. Also, low fat diet is beneficial when fighting TF. That is what stabilized Leroy’s tummy at the end! I found that Royal Canin Light and Brit Care Light were good for that. But any dry food with under 10% fat should be good. I got a tips from Denmark also that Royal Canin hairball dry food also works in stabilizing TF caused diarrhea. Good we will start our treatment soon! P.S. I am in no way associated with Royal Canin or any other cat food manufacturer. I do not write about any cat products in order to advertise them. I only write about what I believe and see works for my cats, in order to help other cat owners out there, if possible.